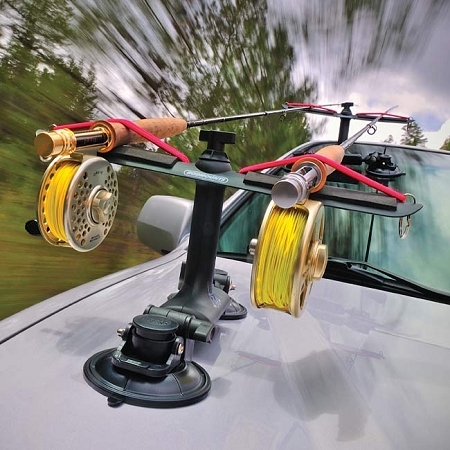 Transporting 9 foot fly rods is not the easiest task for most vehicles. 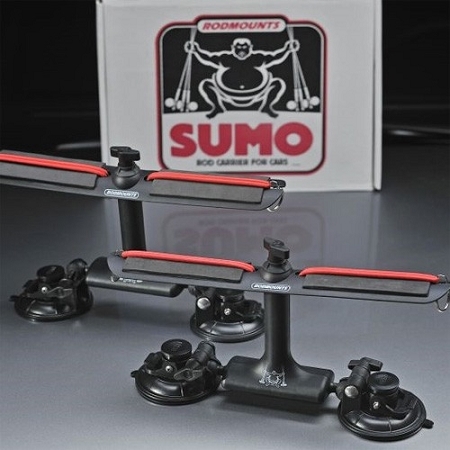 Along comes the Sumo Suction Mount Rod Carrier, the best portable rod rack we've ever seen. Four super-secure suction mounts stay attached to the car even under extreme high-speed driving conditions (not necessarily recommended). Adjustable mounting positions with ball-and-socket connections offer infinite mounting options. Attaches to all nonporous surfaces and stays attached with four independent lever-lock suction mounts. Ball and socket connections and vertical pivots provide unequaled flexibility to mount to any passenger vehicle. Additional ball and socket connection in the rod rest allows rods to be level. Rods held in place with double shock cord and rest of thick EVA foam. Made of the highest quality materials with glass-filled nylon base, rod rests, and socket. Polycarbonate-ABS suction mounts and stainless-steel hardware. Nickel rings for strap assembly. PVC suction mount pads.